The North Buttress is the technical showpiece on Mount Hunter and like the Infinite Spur and the Cassin, it is considered a world class climbing objective. Although it has been called “The Nose” of the Alaska Range, climbers coming to find a similar type route up Mount Hunter will be quite surprised. The sheer 4,000-foot granite buttress replete with difficult ice, rock, mixed, and aid climbing has less than 20 ascents to the top of the buttress and far fewer to the true summit. For even the world’s best climbers, an ascent is a career defining achievement. The soaring tower stands prominent above Kahiltna Base Camp. Even an untrained eye may notice the thin ribbons of ice intertwining down sheer granite cliff bands and buttresses. These are the natural passageways that allow modern alpinists to ascend the intimidating buttress. Climbers attempting the route are on center stage for gawkers at the airstrip. The Park Service often has a high power telescope trained on the North Buttress so curious onlookers can track their progress. The remains of an old porta-ledge used on the first ascent of the Wall of Shadows can still be seen dangling above the Third Ice Band. Each season there is a lineup of potential climbers wanting to ascend a route on the North Buttress. These so-called Moonies (from the Moonflower name) can be found lurking throughout Base Camp, posturing and waiting for the right weather and conditions. The buttress does not succumb easily and despite some good attempts, no one climbed to the buttress top in the years 2002 through 2005. The Moonflower Buttress is a name that is widely used to refer the North Buttress route as well as the entire northern tower of Mount Hunter. 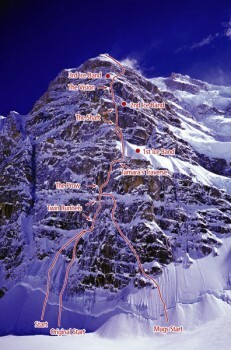 In fact the Moonflower is the name that Mugs Stump attributed to his route after claiming the first ascent. Most of the route that is climbed today follows this line, but there are a few key differences between it and the standard North Buttress route described here. Stump and Aubrey began to the right of the commonly used start, the routes joining at the Prow. Above, Stump followed the line previously established by the White Punks on Dope team to the First Ice Band. This was the high point of other attempts. Stump continued up The Shaft and The Vision, and made a high point near the top of the final rock band below the upper ice face. Above the Third Ice Band, the North Buttress route follows the route of Bibler and Klewin who continued to the top of the pyramid and on to the summit.